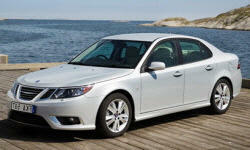 Why the 2008 Saab 9-3? Great styling,looks great and modern. I love the headlights at night, they have a blue colored light strip on top giving it a distinct look at night. The grille and hood lines flow beautifully to the rear of the car. Great car if you want to stand out. The turbo lag isn't as noticeable as it is on other cars I have driven. Faster than most V6 engines. Fuel economy isn't bad for the power either. Not as quiet as a BMW, it has several creaks and squeaks that annoy me, but sounds like any other Saab I've been in. Based on the fact that it's pretty much almost all GM material, the engine, platform, electronics should prove to be as reliable as the typical GM vehicle. Why Not the 2008 Saab 9-3? The standard suspension is really lacking in reducing body roll. Steering is quick enough, and feedback is sufficient, but on the light side. Torque steer is minimal. 2 months after purchasing the car, the value has dropped about 4k from the original price I bought it at.